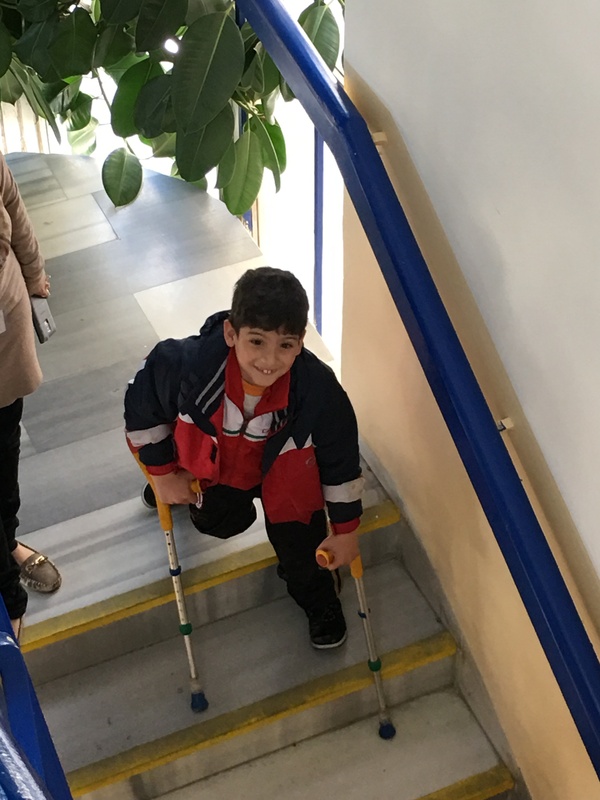 The less-abled children are being helped by trainers at Al Hussein Society (AHS). The eager faces of the little children light up the room, as you can see in the cute photo below. AHS Seamstress works on tote bag for wheelchair training project. The community continues to inspire us. Sireen Syouf is one with especially innovative ideas. She will be hanging MormonAD posters between large sheets of plexiglass. They will be hung all around the hallways in the JOHUD school for girls at high risk. In addition to the wonderful progress that has been made with our humanitarian aid projects we have had the amazing opportunity of receiving a personal invitation from Father Haddad to attend a night of entertainment at the Jordanian Royal Cultural Center. The event was sponsored by his Interfaith Coexistence Research Center and the Council of Christian Church Leaders. We were accompanied with several other religious groups with about 20 dignitaries form each of these religious sects. World Interfaith Harmony Week began on February 9th. We joined Father Haddad at a distribution site about 10 miles from the Jordan River. The emergency project funded by LDSC and others within the Jordanian Interfaith Co-existence Research Center, provided heaters, blankets (made in Jordan) and food for 50 families (about 250 people) at a school that was made available for this purpose. Needy families, selected from the surrounding area by the local county administrator and some county department managers, were assessed for need, registered and then invited to come to the special event. When we arrived at the school a local delegation greeted us and ushered us into the school gymnasium. About 400 people were present. On the stage was a table decorated for the four key speakers to include Father Haddad, Brigadier General Grand Mufti of the Civil Defense Directorate, Director of Islamic Affairs of the County and the County Administrator (the senior government official of the Governate). Each spoke with vibrancy and passion (so eloquent in Arabic) and the County Director acknowledged our presence from LDS Charities, and had us stand to be recognized. Festivities and accolades completed, we exited to the school courtyard and a room was opened. Sister Phillips and I were invited into the doorway to hand out the boxes of food. They weighed about 40lbs each. The other dignitaries were then invited to assist us in passing the remaining boxes of food to those waiting in line. In a very orderly fashion a person (mostly females) would step forward and produce a voucher indicating that she had been selected to receive the food box. The name on the voucher was checked against a master list and then a box was granted. Several of the women had a couple of small children clinging to their apparel and so they hoisted the box on their heads and trudged off to the bus stop to make their way home…wherever and what ever home was. Blankets and heaters were delivered by truck to specific homes later in the day. At the conclusion of the distribution we drove to a nearby facility to have refreshment in the County Director’s office. It was a jovial conversation and we actually picked up on a few expressions. Water and tea finished, we were ushered into an adjoining room to enjoy a meal of mansaf, the national food of Jordan consisting of a roasted lamb stuck in a large bed of rice and richly doused with a hot, runny yogurt. [This is the meal you eat with your right hand by taking a piece of meat, rolling into to a ball with the rice and yogurt and pop it into your mouth.] They provided Father Haddad and I with a large tablespoon but we were unable to remove the meat from the lamb carcass so the man standing next to us would pull it off with his right hand and throw it into the bed of rice in front of us. This is considered an action of respect. Sister Phillips was given a plate of rice, meat and yogurt and invited to sit on a chair in the corner as she was the only woman present. She accepted gracefully. After the meal, another quick round of tea (herbal) for the Mormons and we were on our way home. Shortly, we were in the countryside on a high hill and Father Haddad had us pull over, get our of our cars and observe the King’s estate in the distance. He took off his ceremonial robes, took in a few deep breaths and told us this is how he likes to commune with God. In our brief chat he told us again about how proud he was to be working with the Mormons and how excited he was to see his daughter go to BYU. Sister Phillips took the occasion to ask how he would feel if she decided to become a Mormon while at BYU. He smiled, placed his hand over his heart and said, “We are all brothers. I would be honored if she would decided to become a Mormon.” It was a great day for all. This little girl, Ella, is a member living in Jordan. To get baptized here, we have to drive north (3-hour round trip) to the city of Husn (near Irbid). This is the only font in country, if the candidate does not want to be baptized in the cold Jordan River. On Jan 24 we met with Col. Ali Zyoud, chair of the Physical Therapy Department at the Royal Medical Society, King Abdullah Hospital. They reported on the wheelchair program thus far, and said they have been very pleased with the donations from LDSC and would like to continue a working relationship with us. This facility is as well equipped as any hospital in the USA. May 25 is a holiday here in Jordan (Independence from Great Britain), and is also the date set for the hospital’s Open House. Medicine is going through a difficult period in Jordan. Current visa processes make it hard for patients to get into the country to receive the care they need. There are additional political and financial challenges to the completion of building the hospital. We met with Zaid Hayajneh –Chair of the Physical Therapy Dept. and were given a tour by Dr. Salim Khatatneh, Hepatologist and gastroenterologist. We will meet the Chief of the Hospital, a neurosurgeon on our next visit. LDSC is planning to donate a neonatal incubator and build relations with this hospital to further the reach of our wheelchair training program. Elder Cullimore and I were invited to gown-up and walk through their six surgical suites. Much of the equipment is in the rooms is yet to be assembled. Once functioning, this will be one of the outstanding hospitals in the entire Middle East. Being associated with the hospital in some fashion would certainly enhance our image and credibility in the medical community. Dr. Khatatneh to the right of Elder Phillips and Zaid (PT) is to his right. We were given a special tour of the newborn/intensive care lab. While well equipped they are in need of a specialized machine for managing pre-mature births. Today we attended the kickoff ceremony for Interfaith Harmony Week (First week of February, as designated by the United Nations), at the largest mosque in Jordan. As invited guests of Father Nabil Haddad, a great friend of the church and highly respected Catholic in Jordan, he arranged for LDS Charities to attend this event. The ceremony drew 500 key people from politics, army, humanitarian work and various church leaders. Father Haddad was the keynote speaker. Everyone was hugely friendly. 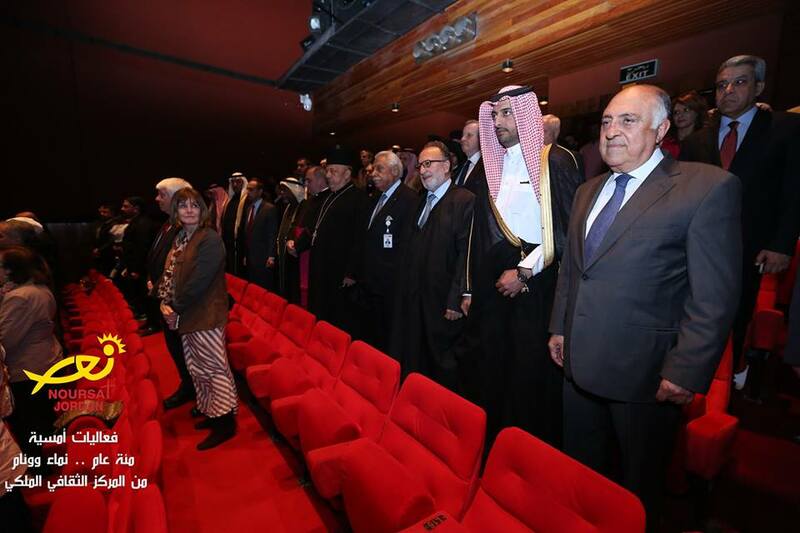 Jordan’s tolerance for all ethnicities and religions allows this type of peaceful interaction to take place. To Reed’s left are two high ranking Greek Orthodox Archbishops. They were jolly men to whom we gave our business cards from LDS Charities. This was about 15 minutes before the meeting started. All chairs eventually filled in. The grand Mufti (highest official of religious Islam law in Jordan) is pictured in this photo with our friend Father Nabil Haddad of the Roman Catholic Church, and Reed. In this photo you can see the inside of the mosque and some of the attendees right before the meeting started. (Sorry for the quality, its a photo of a picture someone else took). I think I was the only woman in the center section. Women sat on one side and men on the other, but as guests of the Keynote speaker they ushered us down to the front center section. Majority of women covered their heads for entrance, but it was not required. Out of respect for their religion I chose to wear a scarf. Father Nabil Haddad of the Catholic Church. He was happy to stand in front of the LDSC sign for the photo attached. He’s a highly respected Christian here in jordan, and was invited to General Conference, had tours of BYU and humanitarian centers—last October. He loves LDS people because of their values and morals and wants his own daughter to go there. Father Haddad was so impressed with what he saw during his visit to Utah last October, especially the happiness exhibited by those he met at General Conference and at BYU, that he openly and quite literally has a testimony of family values taught by the Church. We’re doing some humanitarian projects with him and his church. Lots of planning for the upcoming World Interfaith Harmony Week the first week of February. We visited with Father Kildani and delivered $5K bank check to him as a down payment for his water cistern project–a cistern to collect water in their parking area to help with water storage for the shortage in this country. He said he will immediately schedule the engineer to draw up the plans. He suspects it can be done in 2-3 months. We will continue to monitor the progress. We met with GUVS (General Union of Voluntary Societies on Jan 10. This organization has imported six shipments of wheelchairs over the past three years. They have experienced issues with licenses, bills of lading, etc. Average cost of wheelchairs is under US$100. We were able to host Elder and Sister Cullimore for several days. We took them to the Al Hussein Society (AHS) to observe the placement of some beneficiaries in wheelchairs that have been provided by LDSC (LDS Charities). This was our first experience seeing the fruits of the wheelchair project, and it was quite fulfilling. On this distribution day, about 15 people were fitted with new wheelchairs. The little boy seen in the photos below was being lifted into his first wheelchair. The Physical Therapists measured him for the correct size chair and seat bottom cushion, then lifted him into position. He is lucky to have a mother and father who care about him, despite being poor. Heretofore, his parents had to carry him everywhere he needed to go. He was apprehensive at first, but look at the happiness on his face as he got put into position! He thinks the wheelchair is a very special toy. He clapped his hands as best he could. I had to turn away for a minute to get composure as I was overwhelmed with joy. What a wonderful experience we will have over the next 22 months! We have been very busy these first few weeks in January. Its exciting to think that we have already been on our mission for over a month! We have been sending out lots of emails and Natalee is trying to consolidate them on our blog. Some photos and snippets from our updates are below. Please let us know if you have any questions or if you would like to know more specifics about any of our projects. We love and miss you all! Thanks for reading our blog. Reed’s view from our apartment window. Quite a bit different from what he looked at from our home in Inkom! Major construction going on in front of our apartment each day. They are turning this into a high speed roadway, so there will be no more parking spaces in front of the center. We got a new GPS for the car that runs 30% faster. That’s probably why we’re driving so confidently! We’ve made multiple visits to the fruit market, meat market and dry cleaners. We start teaching institute next Tuesday and will probably open it up to the ward.This year for Institute, we’re going to discuss histories on each of the 50 Arabic hymns—one each week. We’ll then sing it in two languages, I’ll play, we’ll practice conducting, and have a treat related to it (like Johnny Cakes for Come, Come ye saints, etc.). We want it to be really interactive, practice leading, language and singing, learn some history and hopefully feel the spirit. I am playing just “okay” for the Arabic branch, and conducting in the English branch alternating with two other sisters. We feel helped as we learn Arabic, and blessed as we associate with the good people in the branches, and as we work with such high quality partners that really value human life and want to eliminate suffering. We are energized as we see their own efforts. The Lord truly cares about the lovely people in this part of his vineyard. Each early morning we walk for 45 minutes in the park and feel the crispness of the air and take in the beauty of the trees and trails, and it reminds us of what a lovely world this can be—no matter where you are. How blessed we are to have good health and (at least partially) functioning minds for our age. Met with the Director of Programs and the Senior Program Officer at Royal Health Awareness Society (RHAS) to discuss continuing support for diabetes screenings, mobile clinics, etc. LDSC donated $20k to their Healthy Kitchen project last year. We want to do something similar with them this year, as well as work with them on smoking cessation and drug addiction counseling programs. The photos above are all from our visit to JOHUD (Jordanian Hasemite Fund for Human Development). We were able to meet with Qais Tarawneh, the Director of Social Support Programs. 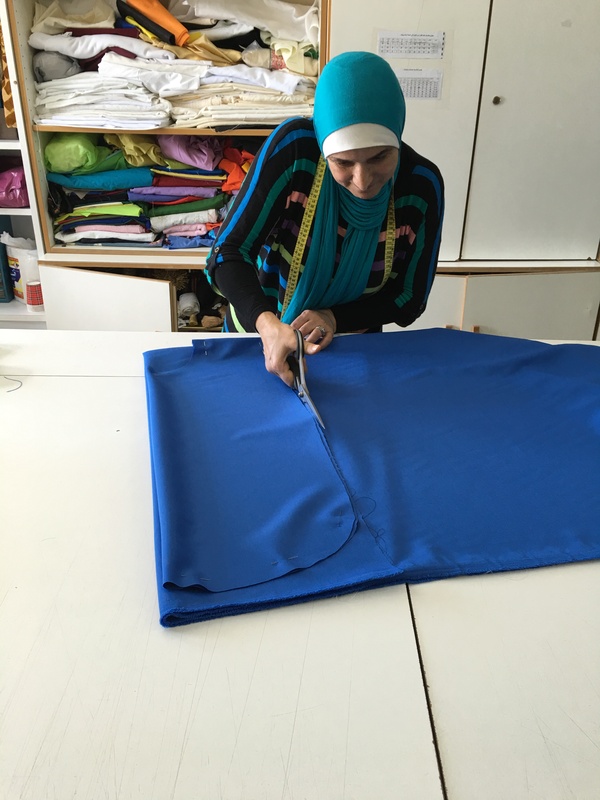 This organization has 57 Community Centers throughout Jordan. They have 5000 volunteers and 600 paid employees. We went to several different centers. One that works with “at risk” children (those who can’t feed their children, often they will marry their young daughters off to older men if they can give them money). These kids are “at risk” of not being educated, thus not being employable, falling into drug abuse and prostitution. One of their biggest challenges is getting the kids from their homes to the center. They have a bus but it doesn’t fit all 300+ program participants. 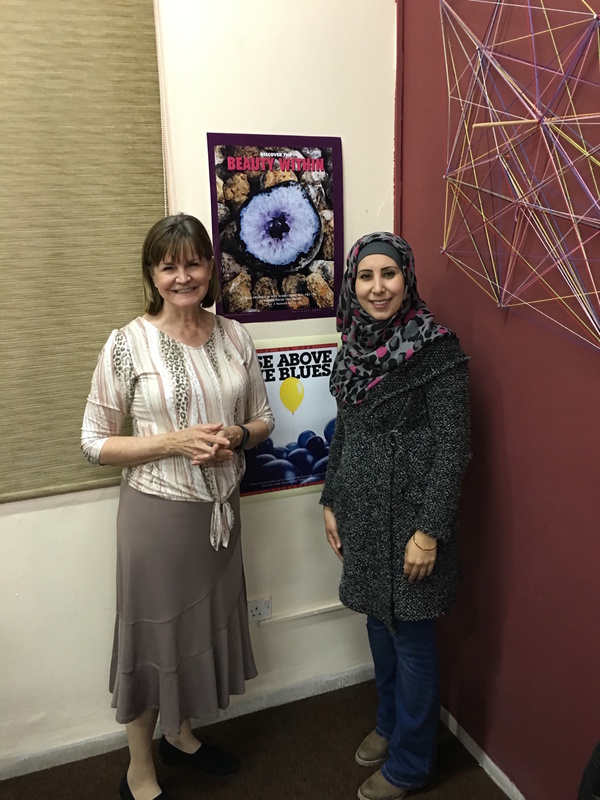 We also visited the Princess Basma resource center, which provides services in East Amman. They teach family life skills, educate, vocational training, morality,they provide medical and dental care to needy families, government and entertainment education as well. Thank you all for your patience while Natalee gets caught up on our blog. We have been sending her lots of information, and we have been extremely busy so there is lots to report. We are happy, healthy, safe and working hard. Met with principals from the Schneller School. They are digging ditches to bury water pipes so fresh drinking water can be streamed to each of their eight houses (of up to 20 people). Currently they have 110 students. The opening ceremony to commemorate this water project is being planned for March. installed a water filtration system for 150+ orphans last month. been out to the facility in east Amman and will go again in a few weeks. or parents who don’t want them. hats, gloves indoors constantly. No proper bathroom for the boys. asked if he could come to Church Sunday. We’ll see what happens. Man…so much need here on so many levels. And we sit in a properly heated lovely room with snacks to make a plan. Seems incongruent, but I realize it’s the way it is. was cold to the bone for hours. Poor little ones.